For a long time, water treatment plants were not regarded as industrial sites in their own right and, therefore, maintenance was treated as a secondary issue and even, sometimes, overlooked. return on investment, by extending equipment service life. The aim is a simple one: optimising functional availability while minimising overall operating costs as summarised by figure 16. 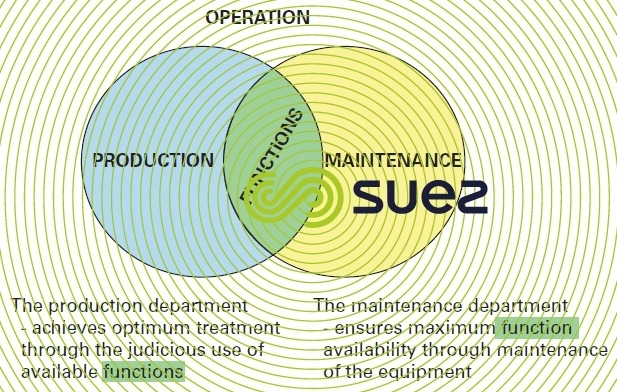 In order to achieve this, the most widespread practice consists in using a computer aided management and manufacturing program (GMAO in French); please refer to the graph in figure 17 for a summary of its functionalities. The market offer in this field may appear to be extensive; it mainly comprises software packages (programmable softwares) with a wide spectrum that primarily target the major industry market (automotive, oil…). These products offer functionalities that are certainly extensive but, in most cases, over-designed. They generally provide a complicated architecture and ergonomics that are perceived as being too onerous for a water treatment plant. On this basis, it may be tempting to use the supervision software to initiate maintenance operations; however, this extremely restricting approach will not provide a true management function, particulary as all follow-up and statistics aspects are almost always systematically hidden. 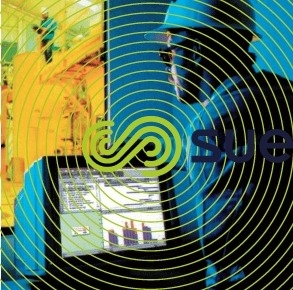 However, computer aided management and manufacturing is absolutely essential for monitoring equipment and for revealing a plant's weak links. This system can sometimes lead to beneficial querying of maintenance practices. In particular, it calls for the equipment list to be updated together with a detailed review of their maintenance requirements. 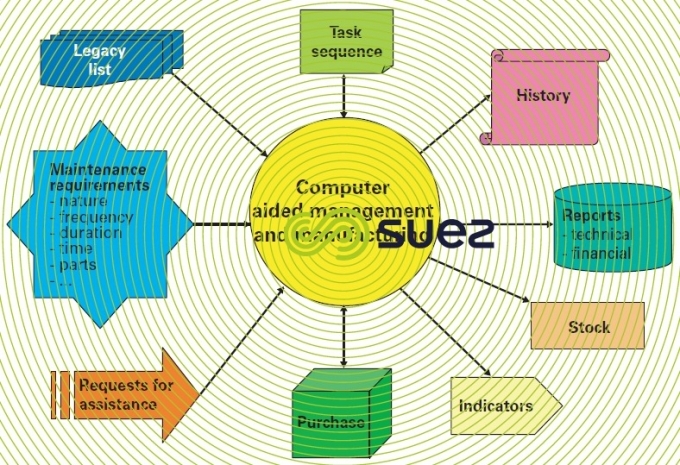 Thus, computer aided management and manufacturing (GMAO) forms an ideal part of the Quality approach. Above all, we must not overlook the human factor because the use of computer aided management and manufacturing involves meticulous data feedback. Therefore, it is essential for operators to be involved and aware of the value of this tool. First and foremost, its application must be simple and intuitive. It is also important not to penetrate too deeply into the definition of what constitutes a maintainable unit and into detailed maintenance operations failing which the value/inputting time ratio may rapidly prove to be unfavourable. when Aquamaint is run, third party information can be incorporated (e.g. digital documentation, drawings, photos…). Aquamaint offers the full range of functions needed and adequate for perfect maintenance management (figure 17). To date, it is in use on several hundreds of sites ranging from 10,000 to 2,000,000 PE.